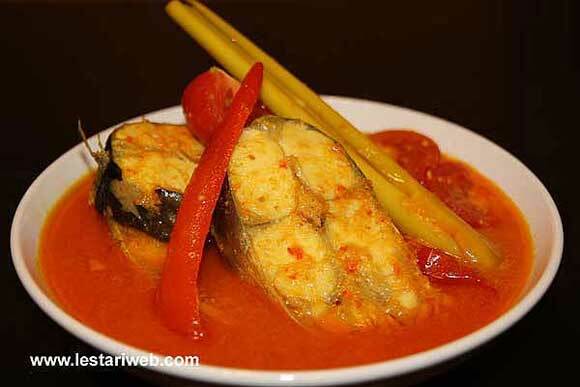 Here it is the original fish dish from the Spice Islands, Maluku : Pindang Ikan Kenari or Fish Dish with Kenari Nuts. As a Javanese who aren't so familiar with traditional dishes from the eastern part of Indonesia, I honestly fell in love with this dish since I have made it for the first time. Even my husband admits, this is a really delicious fish-dish with such a distinctive spice-aroma. In his homeland, the Moluccan people usually make this dish with tune fish or they call it "Ikan Tongkol". But here in Germany I prefer to use Spanish Mackerel or Pangasius-Steak. However the choice is yours. In Maluku this dish will be served as a main course with "Pepeda" (Sago flour porridge), which is the staple food of the Maluku people. Unfortunatelly I haven't seen any sago flour here in the west, though I'd really like to try it myself. For that reason I just prepare it with rice or potato. Still tastes very good though ;-)... 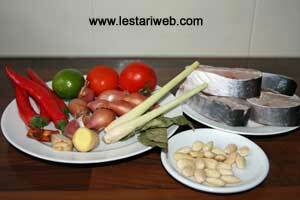 Note : The Maluccan often use "Kenari Nuts" in their traditional dishes including this recipe. Since this special nuts is hard almost impossible to find anywhere in the west, blanced almond is commonly used as a subtitute. Put all ingredients for the seasoning paste in a blender or food processor & blend until smooth. (Add a little bit oil to help the blending process if necessary). The paste is ready when it's colour has changed from yellow into orange and the mixture becomes little bit scrambled. Pour in 600 ml hot water and bring all to boil. Lower the heat into medium and add the fish steak. Cover the pan and simmer until the fish well cooked. Adjust the seasoning and add salt to taste. Add tomato and sliced red chillies ( if used). Cook about 2 minutes only. Add 2 tbsp lime juice and remove from heat.